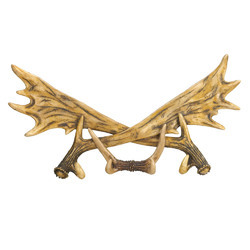 Bring a little bit of the wild into your domain with these unique wall hooks. The antlers are carefully designed with rich details and coloring, and they will help you organize your essentials with great style in the entry way, kitchen, bathroom and beyond. Item weight: 2 lbs. 20¾" x 1¾" x 11" high. Polyresin. Contents not included. UPC: 849179019822.